Grant, Daniel & Long agent Nick Shorten with Wando Grazing Company, Wando, Winton Charolais steers. The steers sold to 306c/kg, reaching a top of $767 to average $594. Cattle numbers fell by 3712 to 6200 head at the Roma Store Sale. Cattle were drawn from the usual supply area with increased numbers of western cattle yarded. A fair panel of buyers was present and operating. The yarding was dominated by steers and heifers and quality was again mixed. Better quality lines continued to sell to strong demand. Light weight yearling steers under 280kg to restockers fell by 4c/kg. Yearling steers 280-330kg to restockers fell by 1c, while medium weight yearling steers to feed fell by 20c/kg. Light weight yearling heifers under 280kg to restockers fell by 25c, while yearling heifers to domestic feed fell by 11c/kg. Medium weight 2 score cows fell by 30c, while the medium weight 3 score cows fell by 15c/kg. A large sample of light weight yearling steers under 280kg to restockers sold to 302.2c to average 284c/kg. A good number of yearling steers 280-330kg to restockers made to 298.2c to average 282c/kg. Medium weight yearling steers to feed sold to 292.2c to average 267c/kg. Light weight yearling heifers under 280kg sold to 250c to average 221c/kg. Medium weight yearling heifers to domestic feed sold to 240.2c to average 224c/kg. Medium weight yearling heifers to slaughter made to 234.3c to average 226c/kg. Grown steers were present in small numbers. A small sample of grown heifers under 540kg sold to 230.3c to average 227c/kg. Medium weight 2 score cows sold to 187.2c to average 162c, while the medium weight 3 score cows sold to 201.2c to average 195c/kg. Heavy weight cows made to 210.2c to average 199c/kg. Light weight bulls sold to 256.2c to average 239c/kg. Weaner steers under 220kg topped at 306c/kg and averaged 244c/kg, weaner steers in the 220-280kg range reached 299c/kg and averaged 241c/kg. Steers in the 280- 350kg range reached 282c/kg and averaged 257c/kg, and steers in the 350-400kg range reached 275c/kg and averaged 258c/kg. Feeder steers in the 400-550kg range topping at 284c/kg and averaging 262c/kg. 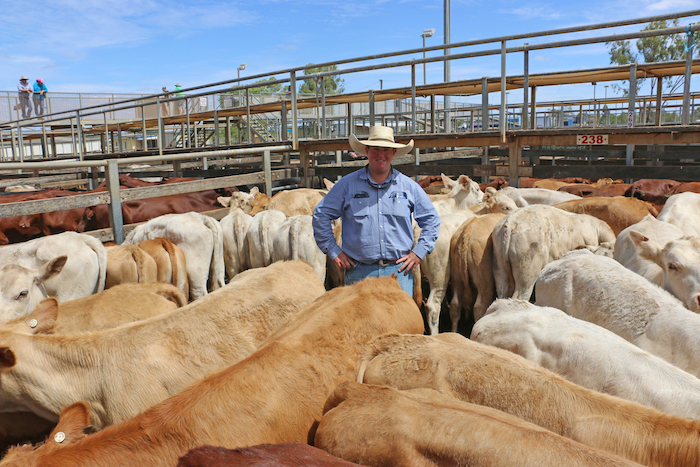 Wando Grazing Company, Wando, Winton sold Charolais cross steers to 306c/kg, reaching a top of $767 to average $594. The Charolais cross heifers sold to 242c/kg, reaching a top of $580 to average $477. Bundella Pastoral Co Pty Ltd, Bundella Station, Hughenden sold Angus cross steers to 299c/kg, reaching a top of $814 to average $553. A Swan, Springtime, Wallumbilla sold Angus steers to 298c/kg, reaching a top of $810 to average $800. DW & CR Collinson, West Myall, Roma sold Angus steers to 296c/kg, reaching a top of $709 to average $685. The Angus heifers sold to 234c/kg, reaching a top of $582 to average $522. CJ Melcer, Sorries, Roma sold Charbray steers to 284c/kg, reaching a top of $1,676 to average $1,395. Michael & Anne Green, Prince Henry Heights, Toowoomba sold Angus cross steers to 282c/kg, reaching a top of $957 to average $902. The Angus cross heifers sold to 214c/kg, reaching a top of $796 to average $674. GJ & CA Roberts, Ridgelands, Injune sold Charbray cross steers to 277c/kg, reaching a top of $1,187 to average $1,155. GN & JR Blacket, Tamanick, Mitchell sold Droughtmaster cross steers to 273c/kg, reaching a top of $970 to average $891. MR Beitz & HM Beitz, Mossview Lodge, Roma sold Santa steers to 270c/kg, reaching a top of $1,182 to average $1,136. RW & KE Thorne, Holmleigh, Mitchell sold Santa cross steers to 265c/kg, reaching a top of $1,204 to average $1,100. Heifers under 220kg topped at 242c/kg and averaged 186c/kg, while heifers in the 220 – 280kg range topped at 240c/kg and averaged 205c/kg. Heifers in the 280- 350kg range topped at 250c/kg, averaging 221c/kg. Heifers in the 350-450kg range topped at 246c/kg, averaging 223c/kg. Barry J McCabe, Myall Hill, Roma sold Charolais cross heifers to 240c/kg, reaching a top of $872 to average $827. Brah-Lim Cattle Pty Ltd, Waverley, Augathella sold Brahman cross heifers to 230c/kg, reaching a top of $711 to average $539. EL & DK Connolly, Tetalga, Roma sold Santa heifers to 226c/kg, reaching a top of $640 to average $640. Cows in the 300-400kg range reached 209c/kg and averaged 143c/kg, while cows in the 400kg-500kg range reached 222c/kg and averaged 181c/kg. Cows over 500kg topped at 224c/kg, averaging 195c/kg.